Speaker of the House John Boehner, in a bizarre attempt to criticize President Barack Obama, wrote an editorial using 12 Taylor Swift GIFs. The oddball move is currently trending online, drawing criticism on social media. Boehner had sent an email to reporters containing his editorial piece, "12 Taylor Swift GIFs for you," in which Boehner vehemently disagreed with Obama's recent proposal to make community college "free for everybody who is willing to work for it." In the piece, Boehner incorporated the use of animated GIF images, while popular amongst social media, seem uncharacteristic of a leader of the United States Congress. Using Swift to describe his opinions on the matter, Boehner loosely connected the music artist by comparing the high taxpayer costs to Swift's album sales. "Turns out...when President Obama said 'free' what he meant was '60 Billion dollars over 10 years.' 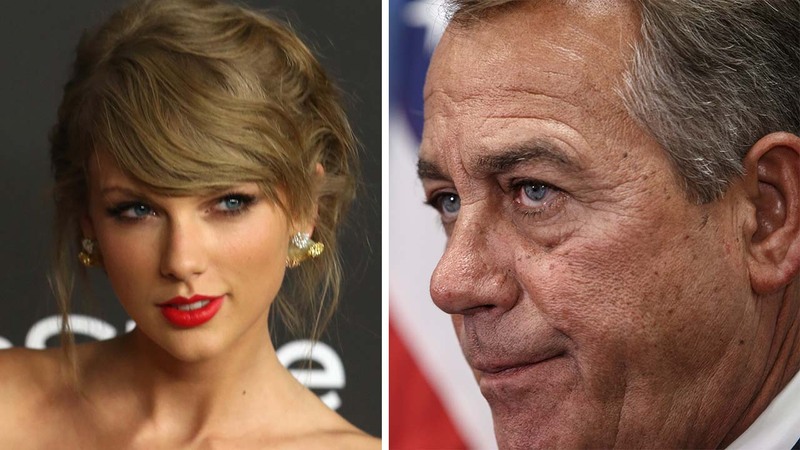 Not even all the Taylor Swift album sales in the world would cover that bill," wrote Boehner including an image of Swift mouthing "what?" "We're not mad. She's just disappointed," Boehner concluded with an image of Swift storming offstage. The full details of President Obama's community college proposal are expected to be revealed in Obama's State of the Union address Tuesday, Jan. 20, from 9 to 11 a.m. EST. Watch it here. ABC has reached out to Taylor Swift for comment.